Over the summer, you've no doubt become familiar with the Bryant Park FitClub series, fitness classes that let you work out before work. Pilates with Pilates on Fifth, every Monday morning, and boot camp with The Rise NYC, every Wednesday morning, activated the park and provided an excellent service to the public. You already know that Boot Camp is an all-weather event (it occurred even in rain) so an extension into the winter should be no surprise. We are excited to announce that Boot Camp with The Rise will continue through the winter. Nervous about working out in the cold? Don't be. Boot Camp's emphasis on cardio will ensure you are sweating, even in a winter chill. And the warm smiles you'll see on each participant's face won't hurt either! 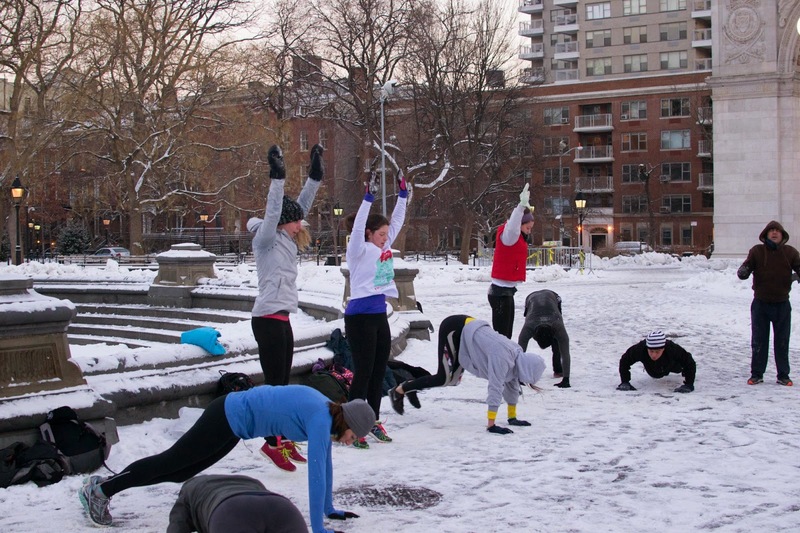 This photo, from The Rise's Facebook page, shows a workout last winter before the boot camp found a home at the park. You can find Boot Camp on the Fountain Terrace until October 8, when it moves to the Fifth Avenue Terrace to make way for the Holiday Shops. Boot Camp will return to the Fountain Terrace on January 14, after the Holiday Shops have loaded out for the season. With an average attendance of 57 over the course of the summer, we are excited to see the program grow over the winter. So come join Boot Camp with The Rise NYC and meet the friendliest, happiest, most positive group of people out and about at 6:30am! You won't believe the smiles and high-fives you're capable of at 6:30am!